Rain is inevitable in Florida. As annual pass holders and long time Florida residents, we braved non stop rain countless times to enjoy the ‘Happiest Place on Earth’. Many visitors will leave during a non stop rainy day, which means shorter ride queues and less people in general. This can make for a pleasant day IF you are prepared for the rain. 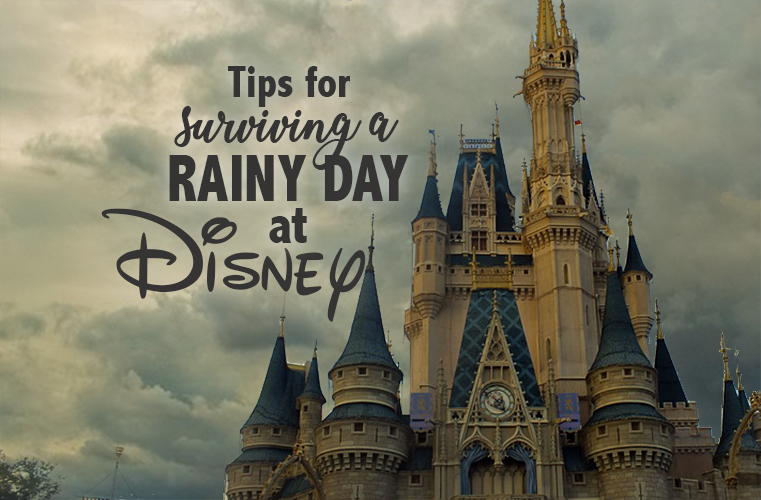 If you’re planning a trip to Disney World, use these six tips to be prepared and make the most of a Rainy Disney Day. This post contains affiliate links. Ponchos sold at Disney gift shops are upwards of $9 a piece! Pick up a few for less than $1 at Wal-mart or the Dollar Tree and save yourself some money. Here’s a pack of 8 for pretty cheap on Amazon. We love using ponchos as a cover for our stroller too in a pinch. They keep baby nice and dry but can be thrown away at the end of the day. 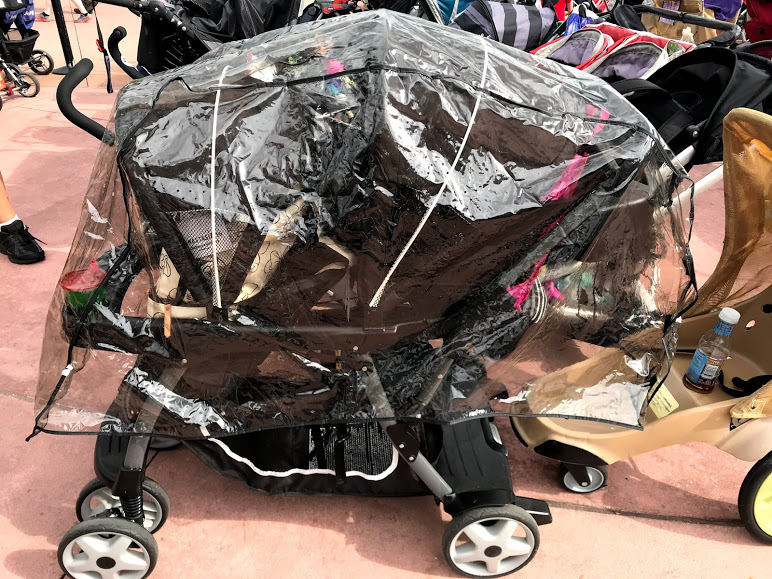 If you anticipate rain on your trip (especially during the Summer season) and have a stroller, invest in a durable plastic cover. This one was less than $20 and has been a lifesaver! Nothing is worse than a soaked stroller. Since most stroller parking is outside and uncovered, and strollers aren’t allowed in a lot of areas, this is a worthwhile investment. Ziplock bags will also come in handy. Storing valuables (money, phones, cameras, etc) in ziplock bags saves them from any potential water damage. This is also a great tip if you plan on riding any ‘wet’ rides. Depending on which park you are visiting, check out the park map ahead of time. Plan to travel the park in a circular motion, hitting each ride/attraction along the way. Scope out sit down shows too. This will provide an opportunity to sit down and stay dry while still being entertained. Although it doesn’t appear this way from the outside, many Disney gift shops are actually connected to form one LONG store with multiple entrances. Spend a few minutes perusing merchandise, or at the very least, use this as a dry walkway. Disney offers lots of shopping so use the heaviest rainfall as an opportunity to grab your souvenirs. While many Disney restaurants are quick service, a rainy day is the perfect opportunity to sit down for a longer meal. With less people in the park, there’s also a better chance of snagging a last minute reservation to one of the more popular restaurants. Check the My Disney Experience App for restaurants closest to you. One of the easiest ways to ruin a day at Disney is by wearing uncomfortable shoes. This is especially the case when it’s raining. Speaking from experience, wet soggy tennis shoes are the worst to walk around in. If the forecast calls for rain, make sure to wear comfortable sandals. Alternatively, pack a pair of extra shoes/socks to change later in the day. Less people, shorter ride queues, yay! Disney is extremely accommodating for cancelled events (i.e. the Jedi Temple Training at Hollywood Studios, when rained out, gives participates the opportunity to meet Darth Vader instead) You may get an equally memorable experience despite stormy weather. 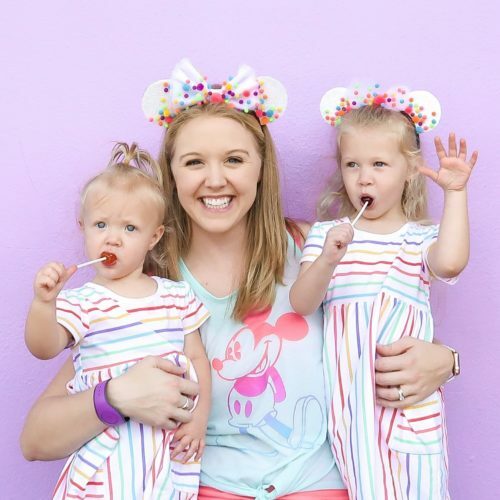 Have you ever endured a rainy Disney day? What’s your favorite tip or trick? I’d love to hear about it in the comments below.